Thanksgiving dinner is a constant that few dare to mess with. Typically, it’s the same thing every year: turkey and/or ham, green bean casserole, candied yams, mashed potatoes, pumpkin pie etc. Very often, there are hand-me-down recipes for each dish, passed on from grandma or even great-grandma and continued with a reverence for tradition. Although most people look forward to the large Thanksgiving spread every year, in recent years, there has been more openness in mixing things up a bit. Utilizing many of the same basic ingredients, Thanksgiving dishes sometimes get remixed into something completely unexpected to stir the pot, if you will. We’ve rounded up a few amazing unique Thanksgiving dishes in case you’re feeling a bit adventurous this year. After boiling and mashing, both types of potatoes are combined with milk, butter, salt and pepper. A literal mashup of two Thanksgiving classics, the yukon gold and sweet potato mash combines the best of both worlds. 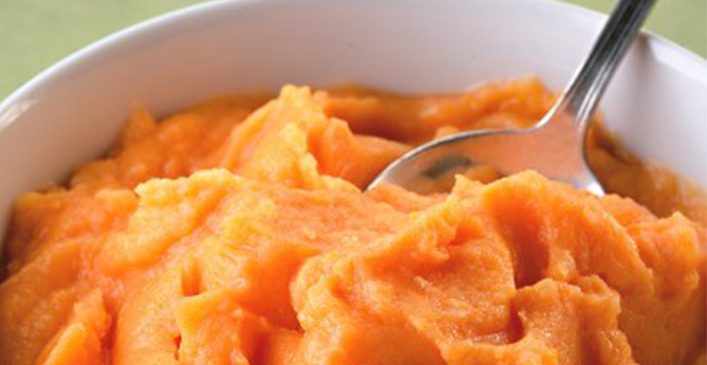 Mashed potatoes get a flavorful twist with the addition of sweet potatoes and a teaspoon of brown sugar. This dish packs a nutrient dense punch and is lower in carbohydrates per serving than straight up potatoes. You can’t have turkey without a side of stuffing. 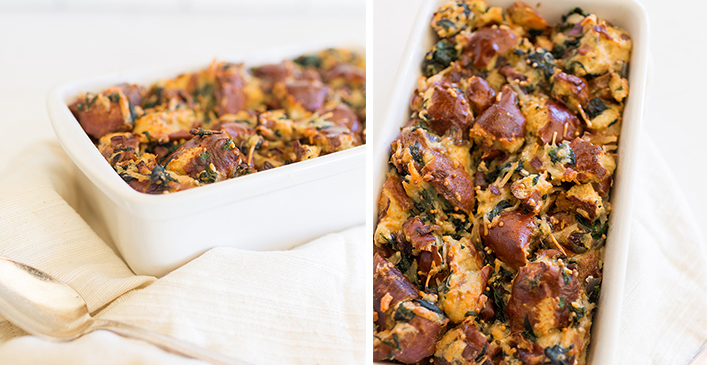 Lauren Conrad’s spinach gruyere pretzel stuffing will have you drooling all the way to the kitchen. Sauteed spinach and garlic are combined with hardened pretzel roll pieces. Chicken stock, butter and egg forms the moisture producing base and is seasoned with salt, pepper, thyme and dijon mustard. Grate gruyere on top and bake for 40 minutes till golden. Move over green bean casserole! Once you make this green bean side dish, you’ll never go back to that tired old casserole recipe. Combined with a maple syrup, dijon mustard and balsamic vinegar sauce, the green beans are sauteed with garlic, shallots and red pepper flakes. 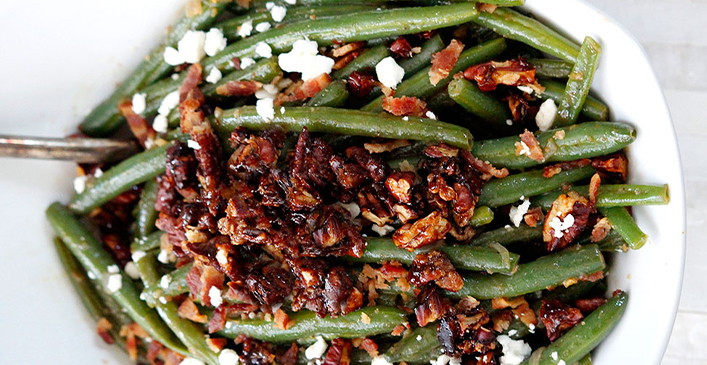 After cooking to desired tenderness, garnish the beans with the caramelized pecans, fried bacon and crumbles of feta cheese. 8 Lies Every Mom Tells Her Kids… Because Sometimes It’s Unavoidable!